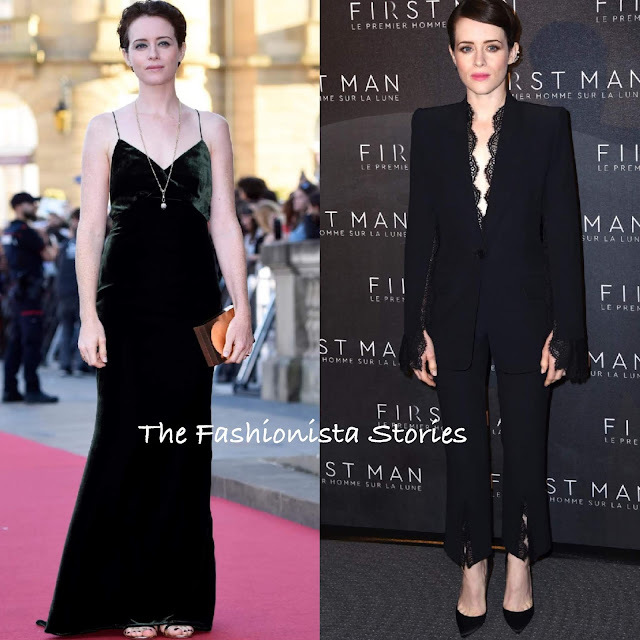 Following the photocall, Claire Foy attended the 'First Man' premiere during the 66th San Sebastian Film Festival and also in Paris. On Monday(September 24th) for the 66th San Sebastian Film Festival premiere in San Sebastian, Spain, she wore a green velvet gown, with spaghetti straps and a crisscross strappy, open back. While her look doesn't excite, she looked great for the occasion. JESSICA MCCORMACK jewelry and AQUAZZURA sandals finished up her look. For the Paris premiere on yesterday(September 25th), she wore a ALEXANDER MCQUEEN black lace panel suit. Her look was accessorized with REPOSSI ear cuffs and CHRISTIAN LOUBOUTIN pumps. I actually prefer the look more. It's masculine, with a feminine touch via the lace.